rajsamand is a nice city which is situated at 60 kms north of Udaipur. It's named after the 17th century lake built by Maharana Raj Singh, The stepped embankment around the lake called Nauchowki or the nine pavilions is dotted with ornamental arches and chhatris. The 4 mile long and 1.75 mile wide lake is fed by River Gomti. rajsamand district is considered to be the major producer of Marble in the state and also single major producer in the country. It has huge resources of marbles and minerals and industries based on these minerals are located at various places in the district. rajsamand lake is located 66km from Udaipur. 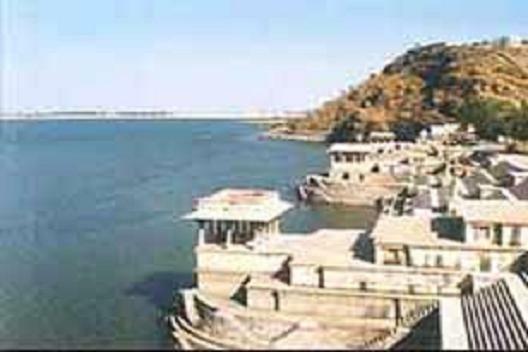 rajsamand or the royal lake is one of the numerous artificial lakes found in the Mewar region and was built by Rana Raj Singh I in the 1660. Maharana Raj Singh is an able administrator of the fifth generation of Maharana Pratap constructed rajsamand lake in 1662 AD, which is a beautiful example of sculpture and public utility works. The banks known as "Nouchoki" consist of 25 carved stone the longest stone inscription in Sanskrit in the world. The stairs, footrest, artistic gates and "Mandaps" are made of beautiful carved marble and the sculpture imparts a new look every time The whole construction is based on the number 9 which is considered to be the absolute number in Hindu philosophy & mythology. Most tourists who visit Rajasthan also come to rajsamand to see places like Kumbhalgarh the birth place of Maharana Pratap, Haldighati the famous battle field, Shrinathji the chief deity of Vaishnav religion, Dwarikadheesh, Charbhuja and many Shiv temples.